This is the diary of Mahmoud. I’ve been visiting my family living in London and am travelling home to Brighton where I work as a taxi driver. I’ve got another day of vacation before I start my shift. I am a fast survivor. That’s the entry one of my players, Alex, left in his diary. It was found covered in blood and brain matter in the back of my notepad shelf. 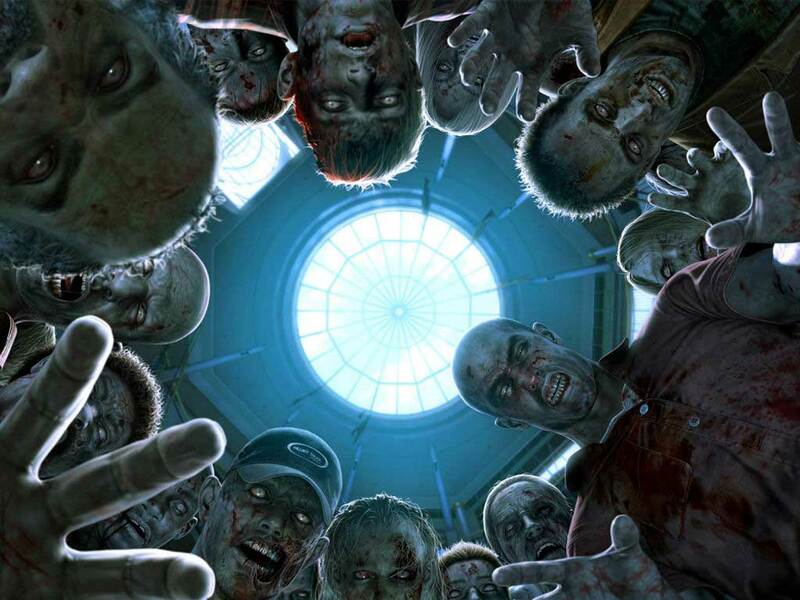 All right-minded people have a zombie contingency plan. I know mine, just in case of the Unlikely But Inevitable Zombie Apocalypse. It’s a fun exercise, not just because everyone seems to have had zombies on the brain for a few years, but it’s an interesting way of thinking about your home, your work. How would you survive in everyday places if something drastic happened? Not just zombies, but any kind of adversity? Obviously I’m not advocating becoming a crazy survivalist, but as a mental exercise it’s good fun. 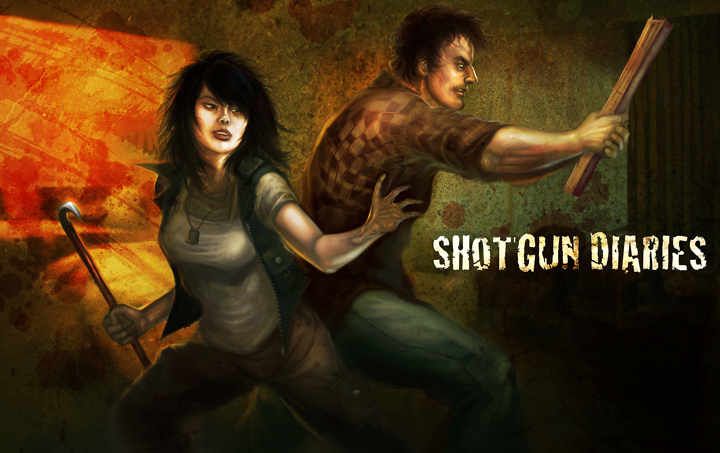 Shotgun Diaries is a game where you can let that instinct go nuts. It’s a tiny game with only a handful of mechanics. The book itself is sixteen pages, two of which are fiction. Each player is a survivor with one stat; what kind of survivor are they? If you are a fast survivor, you roll a minimum of four dice when you need to be fast. That means running from zombies, getting into a car park as the automatic gate slowly closes, that kind of thing. Any other challenge, you roll nothing. NOTHING. Well, technically zero dice. There are ways of improving this, either with supplies from a communal pool, or teamwork. If someone helps, you get one more dice per person, which is specifically there to create a Left4Dead style attitude of teamwork or death. I’ve been working as a firefighter for almost ten years now. Never seen anything like what’s happening. Seen enough zombie movies to know one hit takes ‘em out. I’m dangerous with an axe. Alex’s character Mahmoud didn’t last a day. The characters were attacked at Brighton Station while they were still on the train. They escaped and seeing the berserk fury of the zombies in the station, they ran along the tracks to get away, across the viaduct and down into London Road Station. The pub there, The Signalman, looked safe. They started to prise off some of the barricades someone had hastily built, but Mahmoud was bitten by a zombie no one noticed in time. A damn tragedy, a taxi driver would have been useful. Alex made Jacob Smith… character creation is basically a stat and an opening diary entry only a sentence or two long. The group had ran all the way to the Duke of York’s Picturehouse. They rolled to see if there was enough sanctuary… When they entered, they could hear the cinema was running. It was playing Night of the Living Dead, and all the people in the audience were zombies. They ran as fast as they could next door to the fire station. They broke in and sealed the doors shut. Sanctuary, and Jacob Smith who was perplexed about what was going on, although his access to a fire engine and axes helped them a great deal. Sanctuary is a big part of this game. Rescue is coming after a fixed number of sessions and the characters have to survive that long. You lose one and you make another. Simple, but can you stop them dying just long enough to get invested, to get them some neat abilities and then have your beloved character escape? My group went through easily a dozen or more characters in two sessions. Sanctuary will keep you alive just a little longer. It’ll stop the zombies getting in for a time. If you’re not killing zombies, you’re not needing to roll dice, so if you’re safe then pretty much any action you want to do will work. You’ll get supplies in sanctuaries, too. I was holed up in the fire station until a bunch of other survivors turned up. We’ve nicked the truck and blocked off the Pier. So far we’ve got Chris, the Frenchie, Dan, the punk kid, Frank, the old guy and Austin, a boxer? Thank god zombies can’t climb. The group’s finest moment was when they burst out of the fire station and ploughed down several roads until they hit the Brighton Pier. Someone suggested parking the fire engine in such a way that it blocked the zombies off from getting in. Alex had the smarts to declare that zombies can’t climb. He was deep into playing the system now. They had a nice time with the rides all still working but abandoned, a few characters singing karaoke… It was good for a time. You see, like in any good zombie fiction, the characters are each others’ best hope for survival, and their worst enemy. You have Fear dice. If you see a friend get turned into a zombie, if you suffer some hideous problem, you get Fear dice. They act like normal dice, so a result of a six will help you in a roll, but only if you do something selfish and costly to the group. You run away, but you leave your backpack behind. You shut the door but the other characters are outside. This Fear goes down with time and diary entries, but the ability to screw your friends over for a shot at survival can be far too enticing. Jesus Christ, they’re all dead. All that’s left is that hot schoolgirl Rebecca and creepy headmaster Calvin. Hopefully we’ll be rescued tomorrow. I’ll try to get us all there safely in the car. I know there’s a direct route we can take. 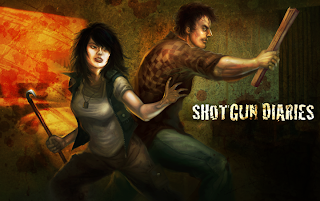 Character needs become quite short term in Shotgun Diaries. A character-defining trait or a zombie-defining trait might fall by the wayside for a moment’s calm or a temporary solution. The characters fled the Pier once it was overrun, one character used the fire engine to distract zombies so that the characters could escape. They found a small yacht and sailed to the marina which was full of panicked and hostile survivors. Sadly there’s not a mechanic for dealing with hostile survivors. If there’s one thing I could change it would be that. Maybe if there was an ‘unrest’ mechanic, or an ‘uncertainty’ one like in Durance (review coming soon!). The closest they have is dicing off if things are uncertain and depending on the result the storyteller or players get to decide what happens. The characters escaped all the way to the Roedean boarding school where an attractive student was living out her worst nightmare of only having the pervy old headmaster as company. The school provided almost no sanctuary, so they had to move on. They tried the garden centre, several small homes and ended up at Riki Tik, a small bar. There’s another issue, the security of a place is pretty much randomly-determined so the choice of location doesn’t really matter. It’s a small complaint, easily handled either by explaining about how thorough the zombie apocalypse was, or having the storyteller add a point or two from the security. It was at this point, after a night’s sleep, one of the NPCs turned and killed several characters. Jacob made it to the end, shockingly. I don’t have the diary entries after this point. They’re too stained with gore, so maybe he didn’t make it that all far. The group made it to Churchill Square which had been secured by a small military presence. Two players had their characters fall in line and start barking orders just like the professionals. It wasn’t welcome. And brought up another problem with the rushed element, some people might be the only ones talking for a while and not let the others get a word in. Things went bad, as they tend to. As the second session ended, there was a call to get to the Odeon, where a military transport would collect them. They fought through the cinema and saw the tank was overpowered. Instead, the fire engine from earlier pulled up and they drove out of the city, safe… for now. 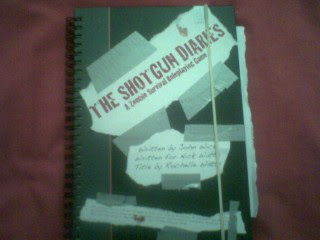 Shotgun Diaries is a really interesting game and great fun for a small season. It’s deadly and you will run through characters quickly. The problem with any game like that is losing investment in the new characters, but the diary entries help deal with it to a point. I may have sounded down on it for the lack of player/npc conflict and potential for the loudest players to be the only ones acting, but it’s still a game I enjoy. The rules dictate the theme and the behaviours, forcing you to keep moving from place to place, sticking together and trying to find the occasional quiet moment for a journal entry. Possibly the best thing about this game is where you set it. I live in Brighton, and all those places I mentioned are real. We’ve been to most of them, as have loads of Brightonians. It adds a sense of the real, and with no prep, setting the game in your home city makes everyone’s job in both easier and more immersive. Thanks to Alex for being the one with an intact diary, Steve, Josh, Shaun and Andy, my players for the session. Rest in Peace; Frank, Lavender, Ace, Austin, Calvin, Chris, Rebecca, Mahmoud, Daniel, Calvin, PJ, Jack, John, Clive, Sue, Jacob and all those whose names were lost. A Tale of VIII Painters - Ray Part 5: Metal Gear?